Interior Minister says he's against a plan by Netanyahu to postpone the presidential election or cancel the presidency altogether. 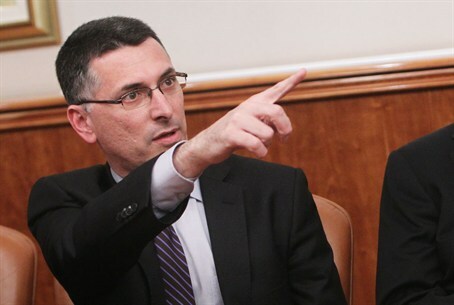 Interior Minister Gideon Sa’ar (Likud) strongly came out on Friday against the cancellation of the presidency or a postponement of the next presidential election. The remarks were made amid reports that Prime Minister Binyamin Netanyahu was looking at either postponing the vote by six months or cancelling the presidency altogether. “I will oppose any attempt, if such an attempt is made, to postpone the date of the presidential election or cancel the presidency before the vote,” Sa’ar wrote on his Facebook page. “You do not change the rules in the middle of the game,” he declared. The vote in the Knesset on the replacement for current President Shimon Peres is scheduled for June. Channel 2 News reported, however, that Netanyahu recently approached the heads of the parties in his coalition - Yair Lapid (Yesh Atid), Naftali Bennett (Jewish Home), Avigdor Liberman (Yisrael Beytenu) and Tzipi Livni (Hatnua), and urged them to assist him in passing a law that would allow to postpone the elections by six months. According to Netanyahu’s plan, during those six months, Knesset Speaker Yuli Edelstein would serve as acting president while Netanyahu will try find a new candidate, change the way the president is elected, or cancel the post altogether. The reason for Netanyahu’s move is his reluctance to publicly support any of the declared candidates. Two members of Netanyahu’s Likud party, Reuven Rivlin and Silvan Shalom, have expressed a desire to run, but both of them have shaky relationships with Netanyahu. Labor MK Binyamin Ben-Eliezer, who has already collected the ten required signatures to ensure his candidacy and who has been endorsed by his party, is considered the opposition’s candidate and it would not look good for Netanyahu to endorse him. This is not the first time that reports have surfaced of Netanyahu’s intention to get out of the upcoming presidential election. In February, Army Radio reported that Netanyahu was looking into the possibility of turning the election of the president into a popular vote instead of having the Knesset members elect the president. According to that report, Netanyahu was looking into extending Peres's presidential term by one year, in order to allow the Central Elections Commission to prepare for a general vote, along the same lines as the preparations for general Knesset elections. Bennett and Livni were reportedly investigating the possibility of joining forces to cancel the post of President of Israel, a largely figurehead position, but it is unknown whether either of them agreed to help Netanyahu with his latest initiative. Edelstein told the Yisrael Hayom daily this week that he would support holding a discussion on what should be done with the post of President, but added that this should only occur after the upcoming presidential elections. "There may be a place for a special commission to examine these issues and formulate recommendations, but there is no place to discuss it in the 11th hour, before the presidential elections,” said Edelstein.